What Happens To All That SuperPAC Money When A Candidate Drops Out : It's All Politics When former Texas Gov. Rick Perry dropped out of the presidential race, a superPAC supporting him was left with millions of dollars in the bank. So where did it go? And what are the rules? Rick Perry ended his presidential campaign Sept. 11, but there was $13 million left in the bank of a superPAC supporting him. The superPAC says it's given donors their money back. 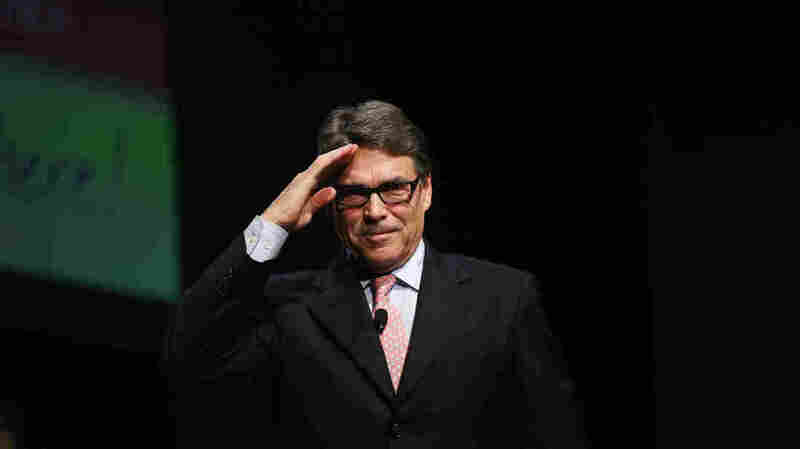 Opportunity and Freedom PAC, and its two siblings, Opportunity and Freedom PAC numbers 1 and 2, were meant to be heavyweight sluggers for Republican Rick Perry, providing big-budget support for his second presidential bid. But Perry himself turned out to be a welterweight at best. The former Texas governor entered the race late, raised a skimpy $1.1 million by June 30 and "suspended" his campaign barely two months later. "We had a plan," political consultant Austin Barbour, senior advisor to the superPACs, told NPR. "To me it also represents the peak of spending absolutely foolish money. It's not rational, but I love it." The plan began with more than a month of TV ads in Iowa, starting when Perry announced. It took a new course when Perry's campaign coffers emptied out and the superPACs poured money into Iowa field operations. Finally, Perry's withdrawal in the early rounds of the primary season left the superPACs with the plan mostly unimplemented and $13 million unspent. So what happened to that $13 million? It's gone back to the donors – mainly Dallas businessmen Darwin Deason and Kelcy Warren. "The wire transfers have already been processed," Barbour said Friday evening. Deason, who lives part-time in Dallas, is reportedly worth $1.38 billion. He founded a company that handles processing for companies like E-ZPass. He sold it in 2010 to Xerox for $6.4 billion. He's gained attention for how he spends some of that money, including on his 205-foot yacht, Apogee. "Apogee means pinnacle in Greek," Deason told ForbesLife magazine in 2012. "To me it also represents the peak of spending absolutely foolish money. It's not rational, but I love it." Congress long ago passed a law limiting what candidates can do with unused campaign cash — in particular, they can't take it home with them. But that law doesn't apply to superPACs. This is only the second presidential contest since superPACs were created, and there is no law regarding left over money for the groups given their relative infancy. Yes. In 2012, the presidential superPACs generally wound down at the same rate as the candidate's hopes, with one exception. When former House speaker Newt Gingrich dropped out of the GOP primaries, the superPAC Winning Our Future returned $5 million to Miriam Adelson. She and her husband, casino billionaire Sheldon Adelson, had been the major underwriters of Winning Our Future. Their money had kept Gingrich in the race weeks longer than he could otherwise have managed. But the superPAC alone wasn't enough, as Perry realized this month.